Ooh, I've been looking forward to this one. And yes, this review might be later than you'd otherwise expect, but for Aesop Rock I wanted to give myself the space and time to fully digest this. As a rapper I'll freely admit I got into Aesop late and it took me a while to fully absorb his dense production and even more dense and layered rhymes and content, but The Impossible Kid took two big steps towards accessibility in 2016 and it wound up being one of my favourite hip-hop albums of that year, and one that I return to regularly to this day. And what I really admired was the change in tone - many of his projects could have a heavyset grimness that could be hard to process if you weren't in the right mindset, and yet for as creative of a wordsmith as Aesop was, I really liked the steps towards a more varied tone, if not precisely a lighter one. And that takes us to Tobacco - signed to indie label Anticon, he's a psychedelic-funk electronic producer and frontman of the critically acclaimed band Black Moth Super Rainbow. Now they've worked with Aesop Rock before over ten yeas ago - Aesop even brought a verse to a breakout single 'Dirt' - but here they've teamed up for a full collaborative album that looked to bring a very different, borderline silly tone to bear. And I'll admit that Aesop was looking to bring a bit more levity to bear, this could be a really fun album, so what did we get with Malibu Ken? Well, we got a damn great album, that's for one, and exactly the sort of project that shows how Aesop Rock is ageing into relative accessibility increasingly well in both his imagery and storytelling - but is then going to pair it with Tobacco's warped gurgling mire of off-key, keening synths and limited beats. In other words, it is absolutely an acquired taste if you can't wrap your head around the production, and it took a long time to truly sink into it, but it's absolutely the first great hip-hop album of 2019 and probably one that'll have a solid shot at year-end lists regardless. And we're going to have to start with Aesop rock himself - and I'll say this, I'm not sure what has inspired this pivot in recent years to slightly more immediately understandable narratives and storytelling, but it's a great step regardless of motive, mostly because he's so damn creative. Yeah, I wouldn't say that Malibu Ken is quite as personal as the fantastic cuts at the core of The Impossible Kid, but Aesop can still mine an impressive amount of detail out of relatively mundane occurrences with a brand of writing that exposes it all with strikingly vivid detail. And sure, a big part of this is because Aesop Rock has a huge vocabulary for storytelling, but his ability to mine pathos out of what some might brand trivial observations is what gives his material so much punch, even when the story is not his own. The most obvious standout is the lead-off single 'Acid King', a retelling of the Ricky Kasso murder of Gary Lauwers in the mid-80s, soaked in the iconography of the newest Satanic panic and occult iconography that not only shows Aesop's familiarity with that scene then and now, but also throwing the uncomfortable questions of whether such a killing was more or less than it might have appeared, coaxed through drug abuse and a synth that encapsulates a weirdly dark but triumphant swell. And yet that's one of the most theatrical moments - when this album digs into the weird crannies it can hit some striking observations, like through the mundane exasperation of 'Tuesday' with the persistence of mold and decay around his home, living things that thrive in his absence that are kind of gross but Aesop can at least respect their fecundity. And we get a similar bleak observation on 'Churro', where Aesop talks about the efforts taken to revitalize the bald eagle population and a few that nested in downtown Pittsburgh, where even a webcam was set up to marvel at them... only for a domesticated cat to be brought to that nest to be killed and eaten, and given Aesop's affinity for cats, he can't help but wonder how that pet's owner might feel in this reversal of fortune, especially if he was checking out the webcam feed to cheer up! But that's only the story on the surface, and it's hard to ignore that Aesop chose the bald eagle for a reason, so let's dig deeper into themes and subtext here. Now what I've always liked about Aesop Rock's naturalistic framing is not just how he doesn't pull punches, but that he can see the darker humour in human frailty and failings amidst breaking systems, and it's impossible to ignore how much of that rises into outright text across this project. And yet for as much of a hyper-detailed realist as Aesop Rock is - and how hermetic his own work can feel with the blur of intricate detail, as he himself admits on 'Corn Maze' he keeps his walls up but can admit that level of dejected obfuscation doesn't really drive change or pull a bewildered pop audience - there is a sense of empathy that courses through his work and gives it a prickly sort of texture. Like Quelle Chris he's more concerned with the ordinary people trying to live and get by in this world than statements on how things might change, but Aesop's demographic is in a slightly different lane. He's talking to the oddballs, the shut-ins, the old punks, the skateboarding heshers, the folks who are closer to the edge of society and who might be that much more at risk, but also that much more likely to survive whatever might come even despite a increasingly sadistic police force who might 'turn a quick deli trip into a temple run' as he describes on 'Save Our Ship' - the sort of layered metaphor for both technological absorption and the draining exposure to a hostile outside world. And all of this feels so much more real where it's becoming so much harder to just fall in line, even though as he references on the first verse of 'Dog Years' for some it's inevitable. And yet he can't really exist in that world to the same extent, and while to him it can feel like a hustle in multiple senses of the word - he draws a not-entirely sympathetic comparison from himself to street magicians on 'Sword Box' - and it's absolutely ageing him, especially as '1+1=13' shows his current run of bad luck and raises the unsettling question how much the more powerful really want to gamble with lives. And yet 'Dog Years' shows a frail comfort in that environment that he knows many don't have, even if in a twisted way it can be just as self-destructive and draining to persist on the depressive edge, as highlighted on 'Corn Maze', 'Suicide Big Gulp', and especially 'Purple Moss', a haunted cut that gives him a moment of weary respite as a lonely outcast amidst a larger decaying world, but one that still can dream. But all three cuts highlight how much is reinforced by his art, either from the tours that run long to the pain constantly highlighted through repeated exposure - a theme that also anchored The Impossible Kid and one that holds the central decayed form of Malibu Ken together, but in this world, it's living. So yeah, meaty themes and so much wordplay that this review would be double its length if I attempted to highlight it all, what's keeping this album back? Well, to put it bluntly, it would probably come in the production - and yet not in terms of just being too alien or weird to work. Indeed, once you can sink into the offkilter buzzy wiriness of analog chiptune there's a surprising amount of intricacy in the tonal balance and how they balance against Aesop's flow, and the brisk pace of the album keeps it from being bogged down. And while the best example of this comes on 'Acid King', I also really dug the pulsating but gleaming sparkle of 'Save Our Ship' and 'Suicide Big Gulp', the locked-in oily gloss of '1+1=13', the stuttering spiky click of 'Churro', or the buzzy shudder with the blurry fuzz of the vocal filters of 'Tuesday', most of which will sneak behind songs like 'Dog Years' and 'Suicide Big Gulp' to drive what might coalesce as a hook. But as much as I admire the decaying warbles and appreciate how certain songs can still bring moments that shine all the starker through contrast, I do have two issues with the production. The first comes in the beats, most of which are hemmed-in clicking pieces that rarely pick up much tension or punch - this project is far more reliant on Aesop Rock's delivery to drive that, and there are definitely points I feel he could use the support. The second issue - bizarrely enough - comes that once you grow accustomed to the sound, it doesn't really evolve or get quite as weird as it could. Yeah, the syncopation of the grooves against Aesop's flow can feel bizarre at points, and maybe I'm just spoiled by an ocean of hip-hop that takes as many risks as this project if not more, but I was waiting for the moment of pure incomprehensibility that was so unheard of and alien, but there's a strange uniformity to these tones that can almost feel a bit undercooked. 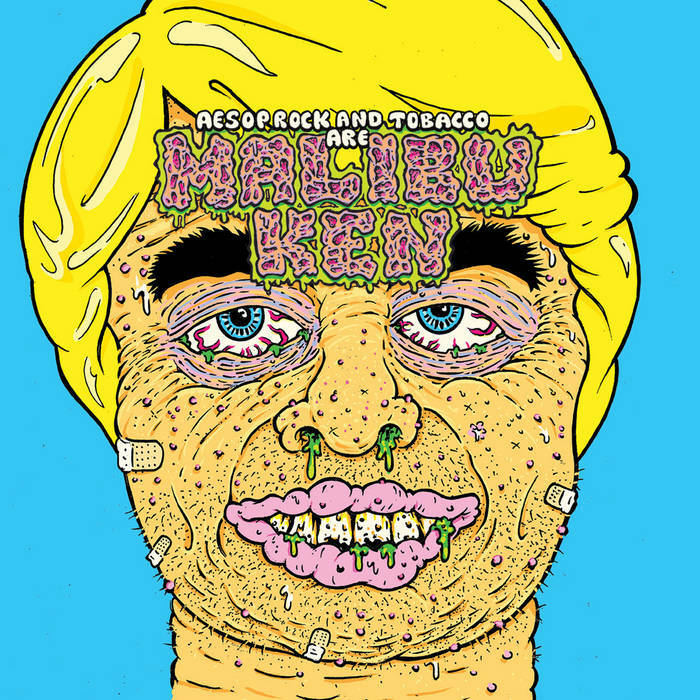 But really, I'm nitpicking: Malibu Ken is an excellent album, another showcase from Aesop Rock that might not quite nail the deep-seated impact of his absolute best - matching the emotional wallop of the middle section of The Impossible Kid would be damn near impossible for any artist, even one of Aesop Rock's caliber - but is still really damn meaty and distinct all the same. And like with Hella Personal Film Festival by Open Mike Eagle and Paul White, while there is the temptation to call it a side project, it's so thematically dense and hard-hitting that I want to consider it part of his main canon, it's certainly great enough to get there! And thus for me, a very strong 8/10, absolutely a recommendation, and while it might take a while to peel into the textured, often grotesque crevasses of Malibu Ken, what you'll find within is often pure gold.